"This exciting saga crosses space and time to illustrate how humans, born of stardust, were shaped -- and how they in turn shaped the world we know today" (Publishers Weekly). This book offers "world history on a grand scale" -- pulling back for a wider view and putting the relatively brief time span of human history in context (Kirkus Reviews). After all, our five thousand years of recorded civilization account for only about one millionth of the lifetime of our planet. 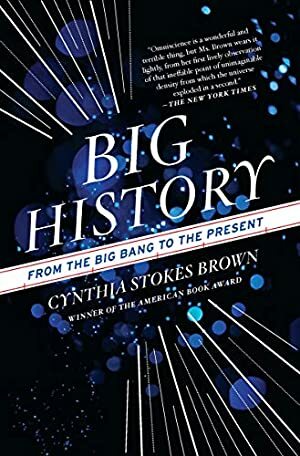 Big History interweaves different disciplines of knowledge, drawing on both the natural sciences and the human sciences, to offer an all-encompassing account of history on Earth. This new edition is more relevant than ever before, as we increasingly grapple with accelerating rates of change and, ultimately, the legacy we will bequeath to future generations. Here is a path-breaking portrait of our world, from the birth of the universe from a single point the size of an atom to life on a twenty-first-century planet inhabited by seven billion people. Log In to track Cynthia Stokes Brown on eReaderIQ. to be notified each time the price drops on any book by Cynthia Stokes Brown. to stop tracking Cynthia Stokes Brown. We started tracking this book on November 19, 2012. The price of this book has changed 53 times in the past 2,346 days. The current price of this book is $9.99 last checked 5 hours ago. The lowest price to date was $1.99 last reached on March 16, 2019. This book has been $1.99 7 times since we started tracking it. The highest price to date was $18.95 last reached on December 3, 2017. This book has been $18.95 one time since we started tracking it. We last verified the price of this book about 5 hours ago. At that time, the price was $9.99. This price is subject to change. The price displayed on the Amazon.com website at the time of purchase is the price you will pay for this book. Please confirm the price before making any purchases.